The popular 70,367-ton, 2,052-guest Carnival Paradise was aptly named because that is what you will find on this Fantasy Class ship. She offers something for all age groups, making her a perfect choice for a fabulous multigenerational cruise vacation. Greatly enhanced with a multi-million-dollar upgrade in 2015, she now features a variety of new dining, bar and entertainment options. You now can enjoy a Mexican eatery with delicious just-made burritos, tacos and tortillas, a full-service sushi restaurant with Asian-inspired favorites and a poolside venue with a California vibe for melt-in-your-mouth handcrafted burgers and fries. A variety of bars with diverse themes include one with a Mexican theme serving frozen drinks, as well as beers, another with mixologists preparing unique cocktails and delicious Caribbean rums served at a different choice. Have a sweet at the onboard candy store that was also added to the ship. 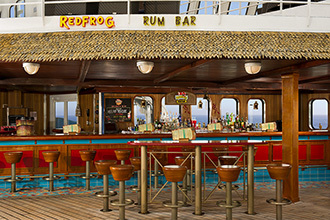 The ship’s stunning centerpiece is a seven-deck-high atrium with a nautical décor. 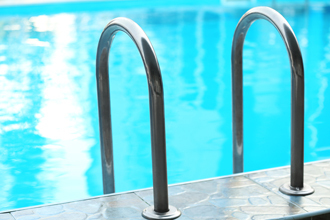 Stroll along the promenade and enjoy the many amenities offered, including two pools and whirlpools. Exhilarating turns will thrill you at the 214-foot twister waterslide — the fastest and steepest at sea — where you will also get sprayed. 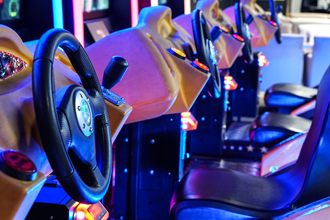 Carnival Paradise boasts 12 chic bars and lounges, a casino, disco, Internet café, library and a game room. Serenity awaits you at a peaceful adults-only retreat. 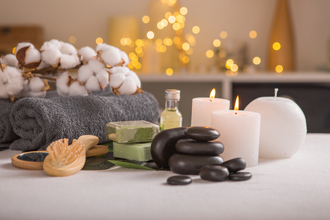 The large spa offers an array of treatments that will make you feel like a million bucks. 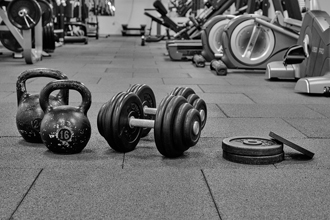 Take a yoga or Pilates class and work-out at the state-of-the-art fitness center. Shop for duty-free items and have a treat at the coffee bar. 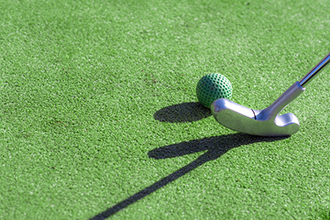 Play mini-golf and shoot some hoops at the large sports park. Be as active or inactive as you like — this is paradise after all. Kids will love the summer camp feel at supervised youth activities that were designed according to age. Tweens and teens also have their own area where they can hang-out with friends, listen to music, dance and eat pizza. A video arcade is another popular place to go. Take your tastebuds on an exciting culinary journey at a myriad of fabulous eateries offering plenty of dining options. Mouthwatering continental cuisine is served at the two main dining rooms, as well as healthy spa fare and delicious vegetarian dishes. A kids menu offers all their favorites, from spaghetti and meatballs to mac and cheese. A special multi-course dinner is a favorite experience for foodies and also includes a special galley tour. 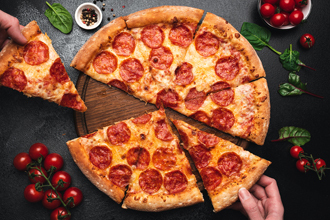 Casual eateries include a buffet with food from all around the world, a venue for wok specialties, a rotisserie, a 24-hour pizzeria with delicious piping hot pizza, a rotisserie, a cafeteria-style café, coffee bar, a grill, a sushi bar and a New York-style deli. Complimentary room service is also available 24/7. 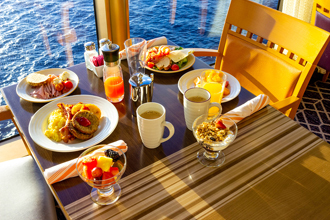 A range of accommodations include a high percentage of oceanview staterooms and those with private balconies. Some also boast floor-to-ceiling windows, providing incredible views. Feel like you are sleeping on a cloud on Carnival’s exclusive comfortable bed system. Relax and watch first-run movies on the flat-screen TV — You will never want to go home. 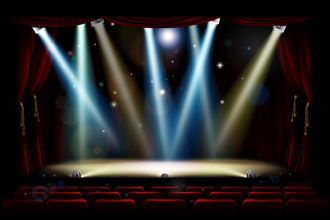 Entertainment includes Vegas-like productions at the two-story theater, as well as magicians, comedians, talent shows and more. 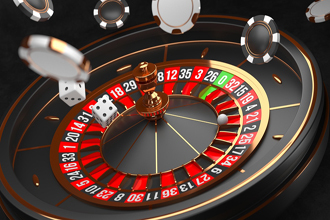 Take part in a game show, try your luck at the casino, join in a sing-along at the piano bar, and dance the night away at the disco and chill-out at the relaxing jazz club. Whether a first-time cruiser or just looking for a delightful fun ship, Carnival Paradise is for you. Cruise on the Carnival Paradise to the Caribbean. Twin bed and one upper pullman. Desk and seat. Full athroom with shower. 3 closets. 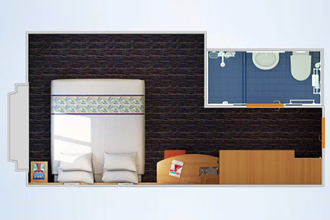 All images are representative of staterooms. Actual configurations may vary. Two twin beds (convert to king). Desk and seat. Full bathroom with shower. 3 closets. All images are representative of staterooms. Actual configurations may vary. Two twin beds (convert to king) and two upper pullmans. A trundle bed will be provided if a fifth guest is booked to this stateroom. Desk and seat. Full bathroom with shower. 3 closets. 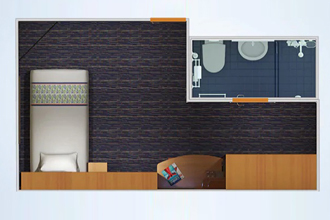 All images are representative of staterooms. Actual configurations may vary. Two twin beds (convert to king). A trundle bed will be provided if a third guest is booked to this stateroom. Desk and seat. Full bathroom with shower. 3 closets. 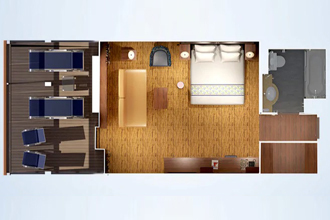 All images are representative of staterooms. Actual configurations may vary. All images are representative of staterooms. Actual configurations may vary. Two twin beds (convert to king) and single sofa bed. Desk and seat. Full bathroom with shower. 3 closets. 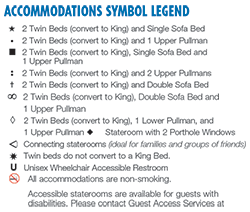 Two twin beds (convert to king) and two upper pullmans. A trundle bed will be provided if a fifth guest is booked to this stateroom. Desk and seat. Full bathroom with shower. 3closets. Picture window. 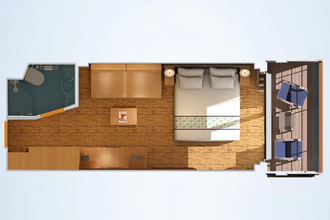 All images are representative of staterooms. Actual configurations may vary. Two twin beds (convert to king). Desk and seat. Full bathroom with shower. 3 closets. Picture window. 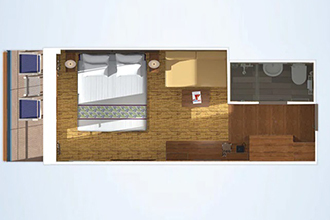 All images are representative of staterooms. Actual configurations may vary. Two twin beds (convert to king) and two upper pullmans. Desk and seat. Full bathroom with shower. 3 closets. Private balcony with patio chairs and table. Note: Twin beds do not convert to king when both uppers in use. 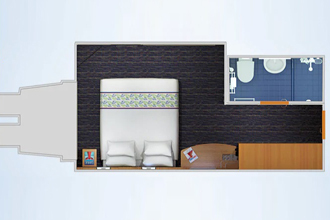 All images are representative of staterooms. Actual configurations may vary. Two twin beds (convert to king). Desk and seat. Full bathroom with shower. 3 closets. Private balcony with patio chairs and table. All images are representative of staterooms. Actual configurations may vary. Two twin beds (convert to king). Desk and seat. Full bathroom with shower. 3 closets. Private aft-facing extended balcony with patio chairs and table. All images are representative of staterooms. Actual configurations may vary. Two twin beds (convert to king), double sofa bed and one upper pullman. Desk and seat. Full bathroom with shower/tub. Walk-in dressing area with ample closet space. Private extended large balcony with patio chairs and table. 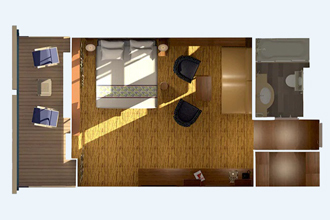 All images are representative of staterooms. Actual configurations may vary. Two twin beds (convert to king) and double sofa bed. A trundle bed will be provided if a fifth guest is booked to this stateroom. Sofa, armchairs and coffee table. Desk and seat. Full bathroom with shower/tub. Walk-in dressing area with ample closet space.Private large balcony with patio chairs and table. Note: Bottom half of balcony railing is solid steel panel. 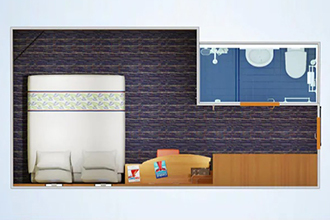 All images are representative of staterooms. Actual configurations may vary. Two twin beds (convert to king) and double sofa bed. A trundle bed will be provided if a fifth guest is booked to this stateroom. Sofa, armchair and coffee table. Desk and seat. Full bathroom with shower/tub. 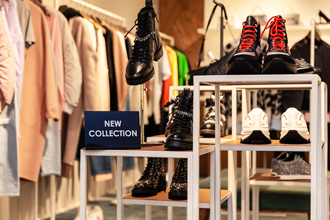 Walk-in dressing area with ample closet space. Floor-to-ceiling windows, plus private large balcony with patio chairs and table. Two twin beds (convert to king). Sofa and coffee table. Desk and seat. Full bathroom with shower. 3 closets. Private balcony with patio chairs and table. Fully Accessible Cabin: This stateroom is designed for use by guests with highly limited or no mobility, who require the regular use of a wheelchair, scooter or other similar assistive devices. Accessible features include entry doorways into the room and bathroom measuring approximately 32”, full turnaround space of approximately 60” x 60” in the room and bathroom, accessible routes throughout the room, 4" lip onto balcony, 1" lip into the bathroom plus a roll-in shower equipped with grab bars, fold-down shower seat and no tub. Two twin beds (convert to king) and single sofa bed. Sofa and coffee table. Desk and seat. Full bathroom with shower. 3 closets. Private balcony with obstructed view; patio chairs and table. Note: View is obstructed by a lifeboat, tender boat and/or steel beam. 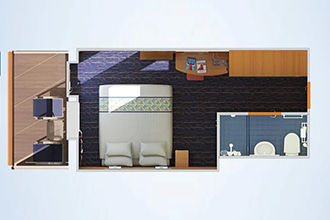 All images are representative of staterooms. Actual configurations may vary. Two twin beds (convert to king). Desk and seat. Full bathroom with shower. 3 closets. Two porthole windows. 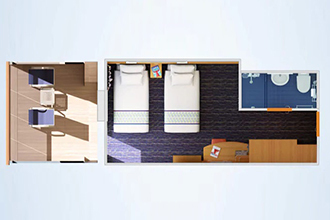 All images are representative of staterooms.Actual configurations may vary. Nibble on a chocolate-dipped strawberry, sip a shot of espresso, and live the good life, Paris-style at this charming café. When you're in the mood for an elegant, multi-course meal, try the delectable menu choices available in the Destiny dining room. 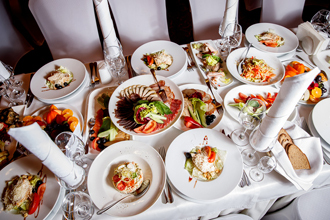 The Paradise's main dining rooms offer a variety of delectable selections in a full-service. 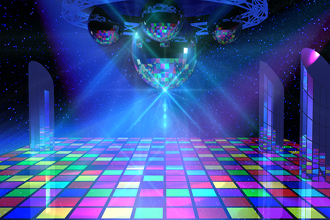 Rex Dance Club & Floor. The Carnival Paradise Photo Gallery is located on the Promenade deck and loaded with some of your best "Fun Ship" moments. 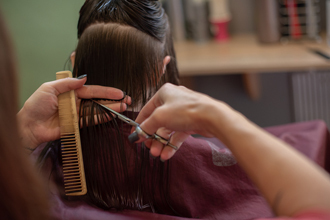 Pick your favorites; then take home your fondest and funnest memories. The best way to fill your day on shore is to explore our vacation destination's hot spots. On their Carnival cruise, kids can enjoy all the best parts of summer camp and family vacation, all in one! At Camp Carnival, they'll start by splitting up into three different age groups: 2 to 5 years, 6 to 8 years, and 9 to 11 years. Our counselors, each with education or childcare experience, are there to make sure everyone in these small groups has an amazing time. And they do, with tons of fun-filled, age-appropriate activities including arts and crafts, dancing, movies, toy-time and video gaming! When it’s mealtime, kids get their own menus, with faves like mac & cheese, chicken nuggets, and more. 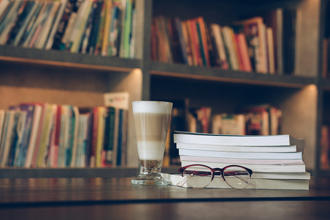 And when the sun goes down, we offer Night Owls (fees apply) so kids get to stay up late having fun, while their parents also enjoy themselves well into the night. Could Queen Mary carry a tune? Who knows, but at her namesake lounge you can hear live music that would have kept her toes tapping. First impressions are important — everyone knows that. We’ll let you in on a little secret: that’s why it’s so important to us that the atrium, your first taste of your Carnival cruise, tastes like ‘wow.’ From the moment you step aboard, the atrium — the heart of the ship — simply screams “welcome aboard!” It screams it with hustle, with bustle, with music and with high ceilings featuring panoramic views of the whole scene from the upper decks. This 360-degree funspot is also the home of the Guest Services desk, the place you go if you have questions for one of our certified fun experts… about just about anything that’s on your mind.